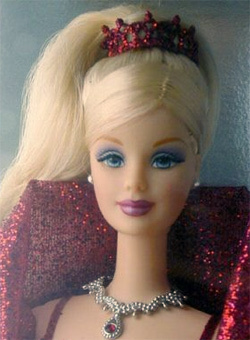 2002 Holiday Celebration Barbie was the 2002 Holiday Barbie. 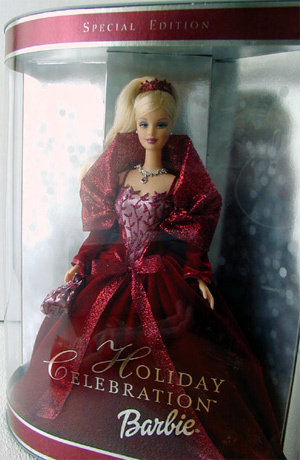 She is the third Celebration Barbie, but the first one to be called Holiday Celebration. She is wearing a long sleeve burgundy velvet gown with a full skirt and a crimson glitter and tulle stole. The skirt and bodice have sparkling accents. The dress is accessorized with a matching handbag, earrings, necklace and hair band. She is the first doll in the Holiday Celebration series to have rooted eyelashes. 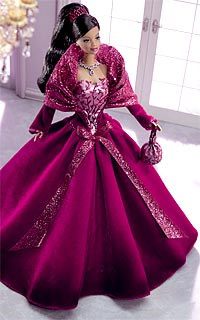 She is a very elegant doll, especially in her elegant burgundy and silver box. She also came in an African American version and Hallmark sold a Holiday Celebration Barbie Ornament in 2002 .